PHP Scripts Mall experts have developed the new advanced On-Demand Delivery Boy App provides you the convenient way to track your packages in real time, from the moment they registered in the system and the moment they reach their destination or delivered to the address, by selecting the vehicles based on their doorstep delivery product packages like bike, van, truck etc. Our experts made research and also user recommends that there is a strong demand for developing a better last mile solution for parcel delivery by using simple and compactable mobile-friendly application. The Courier Tracking Android Mobile Application will make use in most of the major ecommerce organizations, postal and courier service providers who are indeed of tracking their product or goods couriers by using simple Delivery Boy App. This application has authenticated login portals for both the users and delivery providers who can register their account by submitting the valid credentials on the system. The competitive advantage, thus providing better transparency and convenience to their customers. Improved customer experience helps you build brand loyalty. Customer loyalty, in its turn, means better business and higher revenue for you. The On-Demand Courier Delivery App has a user and service provider profile dashboard where they can build their profile. In the user app, they can book the process by entering the pickup and delivery location. After setting the pickup and delivery location, the user needs to select the delivery timing options like delivery now or later, this app automates current location address if the user’s needs to change the location they can enter the specified address. The user has to select the package and payment method in this Courier Tracking Android Mobile Application. Then they have the option for tracking while the delivery is in progress. The user can see driver location after the delivery accepted and then the user can make a call to the driver. There is an OTP displayed and it needs to be verified with the driver once the delivery gets finished. And also the user can give rate card about the vehicles and feedback system to the delivery or service provider. In the Courier Tracking Android Mobile Application, the automation process takes place when the registered delivery person current location is sent to the user. The delivery boy gets instant notification when new delivery request notification arrives. They can accept and reject the delivery request and they can easily manage their delivery report, vehicles management, and payout calculation. The admin can manage the overall management of the application with an efficient managing dashboard and other general settings. 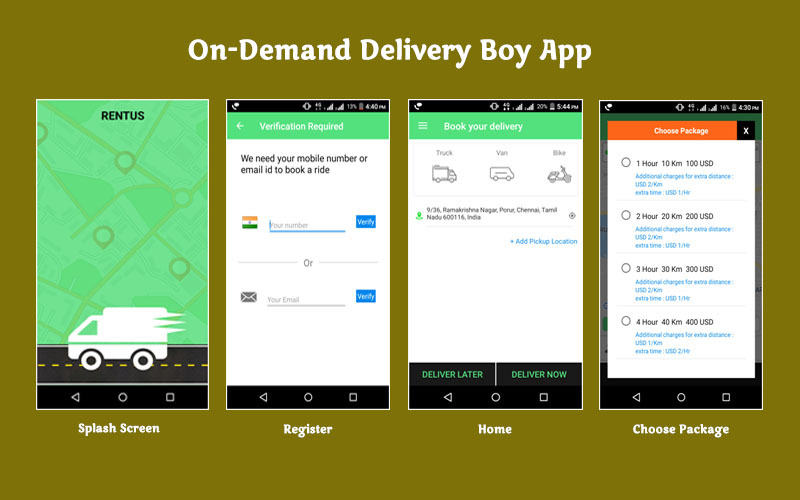 This Delivery Boy App offers better staff flexibility and reduced cost of operations for business owners by customizing the user-friendly application. We are sure that this package delivery is probably one of the most popular crowded niches in the on-demand services arena. Based on the user benefits we provide 1 year of technical support, free updates for the source code for 6 months, and bug-free code. We will provide you with the full source code upon purchase of the script and your website will go live within the next 48 hours. Register with OTP verification, Referral code, Delivery Now & Delivery Later options, Manage Deliveries, Rate card & Support, Booking management, Location map, Driver details, Rating options.